'An important message about the power of reconnecting with the primal self to achieve balance in the modern world. A fascinating read' - Megan Hine Nature is our greatest healer. It's time to start walking and reclaim the wildness in all of us. When did you last take a walk? Not a stroll to the shops, or to the pub, but a walk that got you energised, stimulated your senses, allowing you to de-stress? If the answer is that you'd love to walk, but don't have the time, there really are more reasons to get outside than you might think. When we walk we find the space to process our feelings and we begin to have the courage to be vulnerable and honest with ourselves. Walking awakens the intuition that helps us face up to our difficulties and walk alongside them, enabling us to find positive solutions to our problems. Our ancestors knew all about movement - they walked across the planet, understanding nature and learning to respect and work in harmony with it. Written by a London-based therapist, Walk with your Wolf is part memoir, part self-help and part reflection on the connection we must re-establish with our natural, intuitive selves if we are to live healthy, fulfilling lives. Offering practical advice and exercises on how to walk and think as a method of confronting difficult emotions, this book will allow you to reconnect with your intuition, confidence and power. 'Deftly blending science, his own narrative and his experience as a therapist, he is at our side as we find a way of engaging with and being healed by nature. 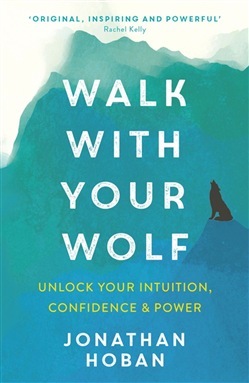 Like the wolf in the book's title, we can reconnect with our own elemental lupine instincts which are so often repressed in our stressful and artificial world - both a wolf's wildness as well as its sociability and need to be part of a pack. Follow in Hoban's easy to apply footsteps and you will never walk alone again. Acquista Walk With Your Wolf in Epub: dopo aver letto l’ebook Walk With Your Wolf di Jonathan Hoban ti invitiamo a lasciarci una Recensione qui sotto: sarà utile agli utenti che non abbiano ancora letto questo libro e che vogliano avere delle opinioni altrui. L’opinione su di un libro è molto soggettiva e per questo leggere eventuali recensioni negative non ci dovrà frenare dall’acquisto, anzi dovrà spingerci ad acquistare il libro in fretta per poter dire la nostra ed eventualmente smentire quanto commentato da altri, contribuendo ad arricchire più possibile i commenti e dare sempre più spunti di confronto al pubblico online.